CLEAN Missouri, a group that received a $250,000 donation from George Soros, is circulating an initiative petition that, if passed in November, would radically change district lines for the House and Senate to make every seat in the Missouri Legislature (except seats held by minorities) a 50/50 toss-up. Every 10 years, following the release of the United States Census, a “redistricting” process occurs to redraw the district lines for U.S. Congress and the seats in both chambers of Missouri’s General Assembly. 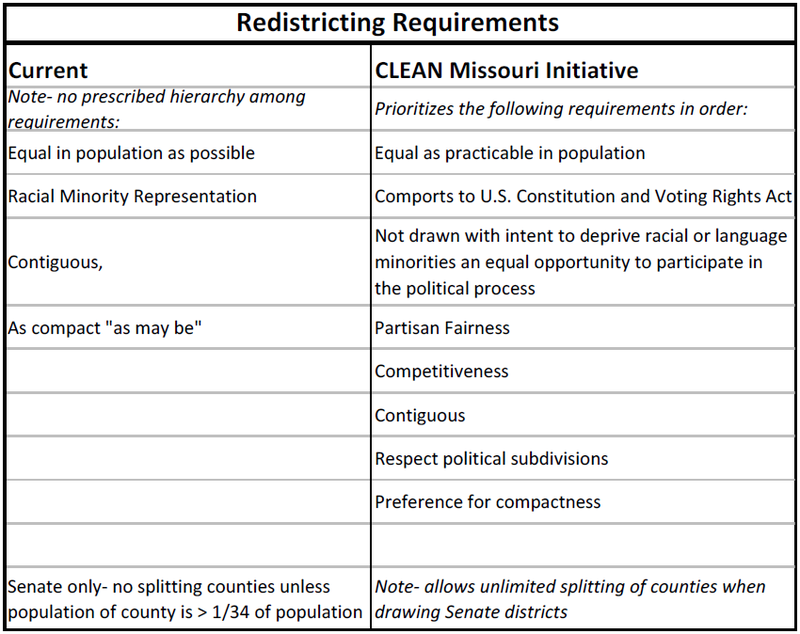 Re-writing the redistricting process is the last of the Initiative Petition’s seven proposed changes to the Missouri Constitution (see box), and it is by far the most controversial. Under the CLEAN Missouri initiative, lines for both House and Senate districts are drawn by a “non-partisan demographer.” To appoint this demographer, the State Auditor will submit a list of at least three qualified applicants to the Missouri Senate. Majority and minority leaders then select the demographer from this list. If they cannot agree on a candidate, each strikes one third of the candidates from the list and the State Auditor selects the Demographer via a “random lottery” of remaining candidates. In a nutshell, and practically speaking, the State Auditor will pick the State Demographer. Currently, committees composed of half Democrats and half Republicans draw the district lines. 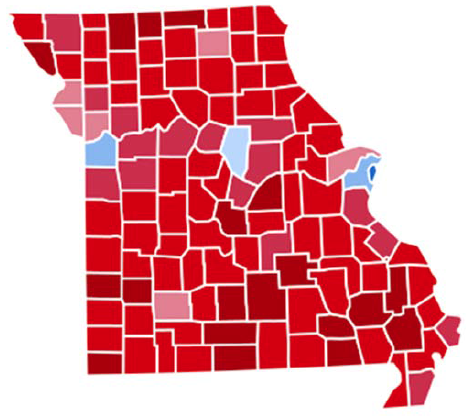 If they cannot get 70% to agree on a map, districts are instead drawn by six appellate judges appointed by the Missouri Supreme Court. Now, these committees are appointed, but they only get input as to how district lines are drawn if they can get 70% to agree on the amended map. Otherwise, the demographer’s map goes into place. If this initiative passes, the person holding the office of Missouri State Auditor will become materially more powerful. Essentially, once the racial minorities and language minorities (new undefined term) are considered and not diluted, the remaining voters must be split up to promote partisan fairness and then competitiveness. 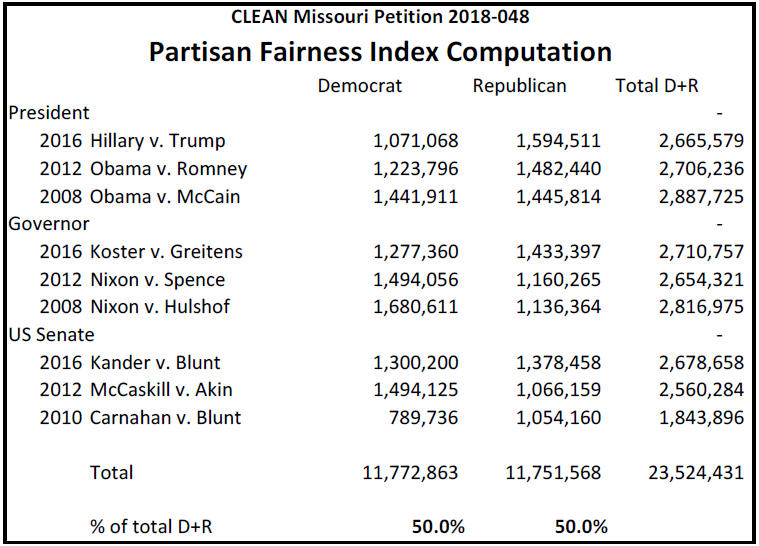 Each district is drawn to achieve partisan fairness based on an index, which calculates the number of Democrat and Republican votes from the last three general elections for President, Governor, and U.S. Senate. Using this formula, districts for the Senate and House would each have to be drawn to be 50% Democrat and 50% Republican (see box). To draw lines that comport with CLEAN’s requirements, nearly every district would have to include a piece of Kansas City, St. Louis, or Columbia. And the elected officeholder of nearly every district could be a resident of St. Louis , Kansas City, or Columbia. Currently, the Missouri Constitution requires that districts be contiguous. It prohibits Senate districts from splitting counties unless a county is in excess of 1/34 of the state’s population (roughly 180,000). It also requires districts be “as compact as may be.” Under CLEAN, all of these requirements would be trumped by partisan fairness. The districts may not even be contiguous. Our district map would end up looking like a long, spidery web of skinny districts. There’s no such thing as too thin, though, right? There are arguably some benefits to CLEAN’s plan. First, it could lead to more unity in the State of Missouri. It could lead to candidates having to be more representative of our state as a whole in order to serve in the legislature. Second, there could be a lot more bipartisanship if most of the officeholders were moderates. Third, CLEAN Missouri would also be a boon to political consultants if it passes because, with more competitive races, there would be more potential clients spending more money to win elections. But there are obviously downsides, too. First, as a Republican, I don’t relish the idea of the Democrats taking over control of the General Assembly. Second, people in more densely populated areas will have a big advantage in raising money than residents living in areas of rural poverty, which would deprive rural voters with an equal opportunity to participate in the political process. Finally, if the districts are long and skinny, you could end up being represented by people who live too far away from you to understand or even care about the issues faced by your local community. It is not known whether this initiative will receive sufficient signatures or if it will even survive legal challenges and be placed on November’s ballot. But the possibility that it looms on Missouri’s horizon is deserving of a lot more attention. Keep an eye on this one and be very careful signing any petitions outside of the post office, folks.